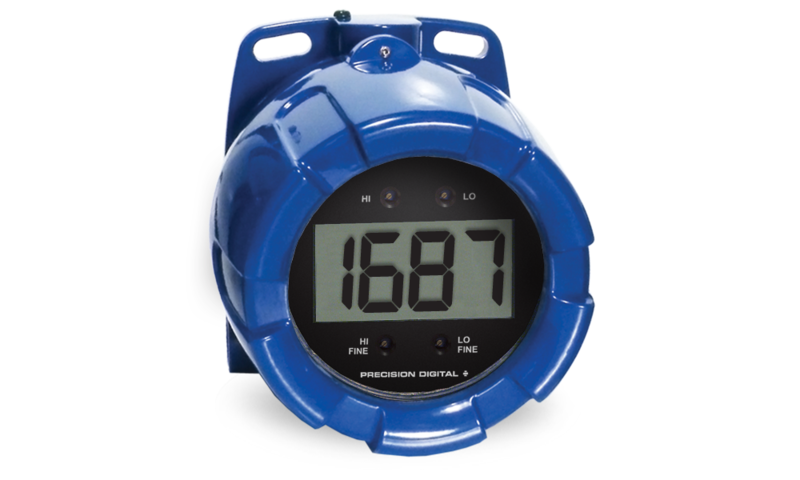 The PD6770 is a general purpose, field-mount loop-powered indicator that is easy to install and program. It can be seen from considerable distance and even in bright sunlight. The fact that this meter is looppowered means that there is no need to run additional, costly power lines. The meter gets all of the power it needs from the 4-20 mA loop and its 1 V drop results in a minimal burden on the loop. 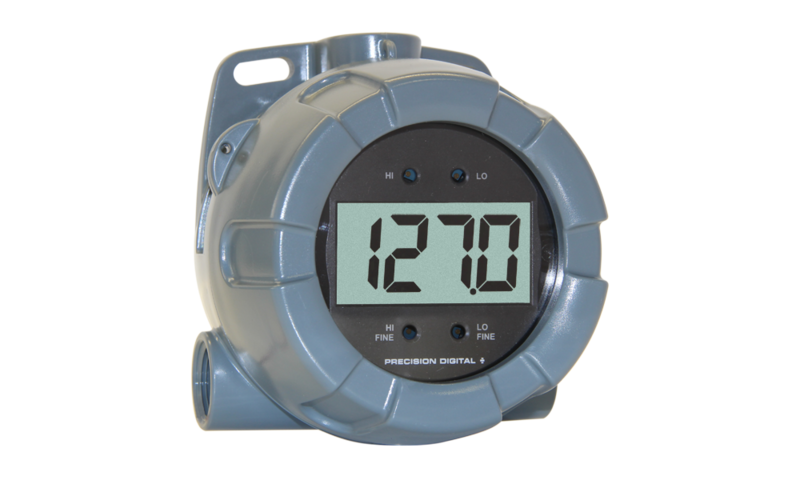 The meter features a wide -40 to +75°C operating temperature range and comes with three ¾" NPT threaded conduit openings and flanges for wall or pipe mounting. Calibration is a quick two-step process involving the adjustment of only high and low, non-interacting potentiometers. 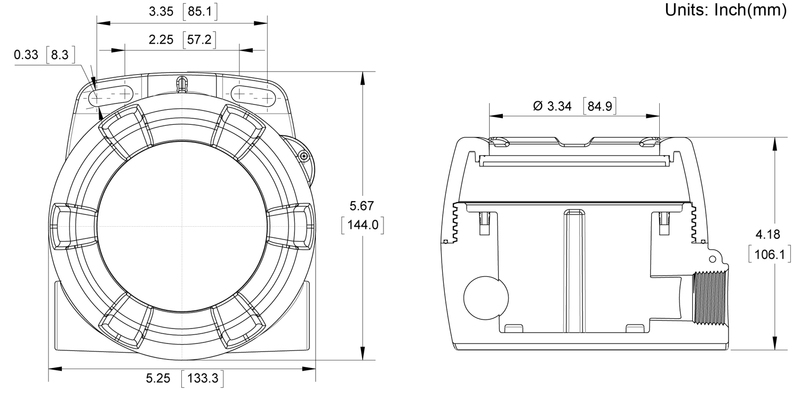 Programming Method: Four front mounted rotary control dials accessed when the cover is removed. Enclosure: NEMA 4X, IP65 plastic field enclosure. Color: grey. Material: Polycarbonate with UV Stabilizer. Three ¾" NPT threaded conduit Two ¾" NPT plastic conduit plugs, with 1.29" wrenching flats and a screwdriver slot, are included. Mounting: May be mounted directly to conduit. Two slotted flanges for wall mounting or NPS 1½" to 2½" or DN 40 to 65 mm pipe mounting. Calibration Range: 4 mA input: -1000 to +1000; 20 mA between 20 and 2000 counts greater than 4 mA display. Two point linear display span. 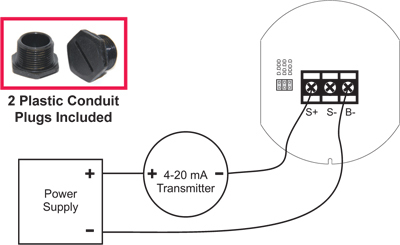 Maximum Voltage Drop: 1 VDC @ 20 mA without backlight; 4 VDC @ 20 mA with loop-powered backlight.